This is exactly why I wanted to be here: I get to do things the way they used to be done. The tool pictured above is called a chitarra, which is Italian for guitar. 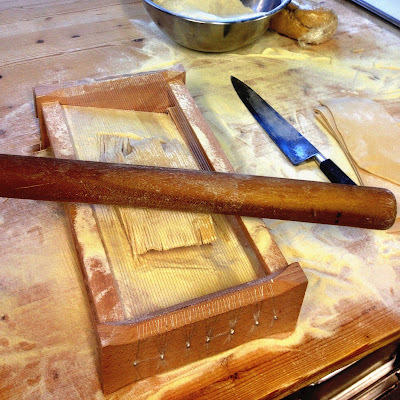 If you had an Italian great-great-grandmother, she probably used one very much like it to cut her pasta. For her sake, I hope she did it in smaller batches than the one I was working with this evening. Kneading nearly four kilos of dough by hand, and then cutting each sheet on the chitarra—even though I had help—took over 5 hours. Tomorrow is my day off this week, and I think I may need it: my arms might actually be sore in the morning!